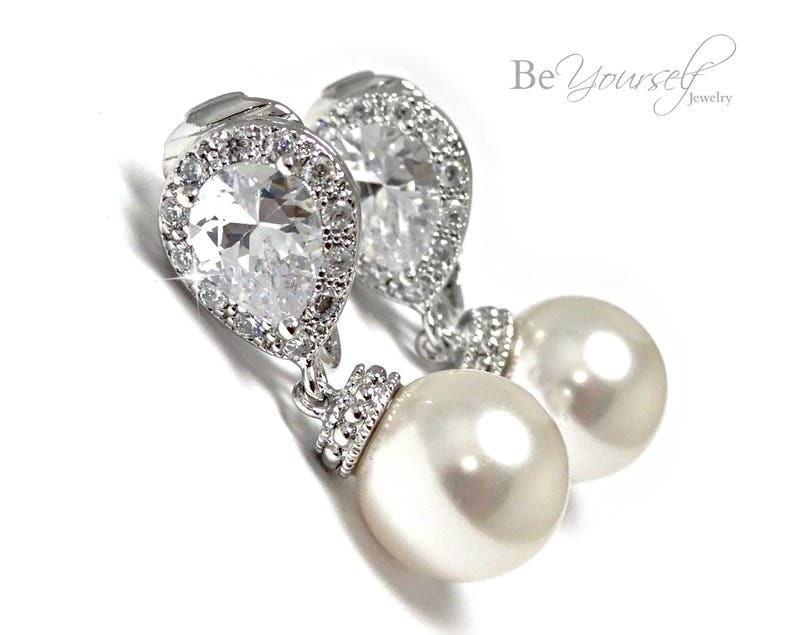 Timeless and very elegant Swarovski pearl clip on earrings perfect for weddings and special occasions. These earrings are lightweight and seat very comfortably on the ears. Great for women with no pierced ears. - They measure about 1 inch in length. Please contact us if you would like to order multiple items for your bridesmaids. We are very easy to be reached and usually reply to our messages right away. Special discounts are available for multiple orders. Don't forget to read our FAQ below for more information. The earrings are absolutely gorgeous! Super fast shipping too! Ordered these for my wedding, as I do not have my ears pierced. They are lightweight and the clasp doesn't hurt on my ears. I haven't worn them for long periods of time, but so far so good! I love these earrings! I’m getting married in another couple weeks, and these match perfectly with the jewelry I already bought. Not having my ears pierced, I wanted some clip on earrings that would be comfortable for the whole day, and these certainly are. While I’d love to give this product 5 stars, I had a problem with the packaging, as when I received the envelope they came in in the mail, it was stamped with a bible quote. I’m personally not religious, and while I don’t mind people expressing themselves, I don’t believe that religion should be forced onto a product you’re selling, especially if the product isn’t related to a religious group in anyway.